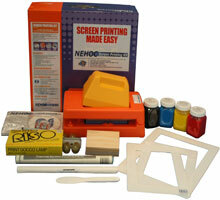 S-868 NEHOC Screen Printing Kit - equipment for t-shirts, fabrics and materials. A complete kit/ basic package containing all the equipment needed to start screen printing onto t-shirts, fabrics, bags and materials. At the core is the PG-5 imaging system using Print Lamp imaging technology to create screen printing screens in seconds. Mesh, Frames, Squeegee, Ink and all the instructions are included to have even a complete novice up and printing quickly. Full package contents listed under specifications. The NEHOC Screen Printing Kit is the base 'retail pack', designed for a complete novice or beginner starting a screen printing operation where the size or number of designs is unknown - as initial start up costs are at its lowest. This kit is used as the foundation of the Starter and Home Business Packages which further expand the system by providing larger printing sizes (A4 and A3), plus multi-colour and 'off contact' printing (printing white and light colours onto black and dark fabrics). We recommend purchasing this Kit in Start-Up Package format, as these Packages contain additional equipment and supplies that will make the overall printing experience easier and faster i.e. Table Adhesive, Screen Correction Manual, etc. Of importance, all packages are supplied with NEHOC Printing Lessons to get everyone printing like a professional quickly - FREE. 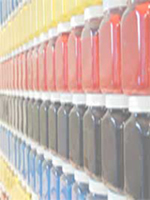 Information Sheets 01 - Artwork Types & Preparation - view now . .
Information Sheets 05 - Imaging ScreenMaster using Print Lamps- view now . .
Information Sheets 25 - Screen Printing Technique - view now . .
Information Sheets 35 - NEHOC Screen Printing Kit Setup & Operation Guide - view now . .